Details: Toasted english muffin with egg, canadian bacon, and cheese. 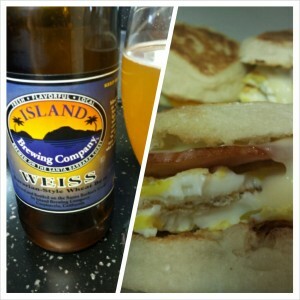 Weiss is brewed by Island Brewing in Carpinteria, California. Island Brewing advertises Weiss as “light and refreshing with hints of vanilla and citrus”. This was my first experience with Weiss and, to be honest, it didn’t quite stand up to some of the other hefeweizens I’ve tried. It had a nice bubble gum aroma as many hefeweizens do, but the flavor profile was very different than I was expecting. It had a bit of a dry champagne flavor and you could definitely taste some of the vanilla. The beer was okay, but it wouldn’t be my first choice for a hefeweizen. The egg breakfast sandwich was awesome. It probably would have been better with bacon but it was still very good. The big question is: how was the beer with the food? The answer is: fine. The Weiss and the egg breakfast sandwich really didn’t seem to affect each other. Neither flavor really improved or worsened. Overall, the combination was fine. Not worth rushing out and picking up these items to pair but if you happen to have them it’s always fun to add a beer to brunch.